With the worldwide release of “Mission: Impossible -- Fallout” just around the corner, the latest installment in the spy action franchise is being hailed as the best in the series. Tom Cruise, known for doing his own stunts, keeps upping the ante as he actually flies a helicopter in a borderline-insane maneuver. Why would a Hollywood superstar constantly risk his life? “For you (the audience). 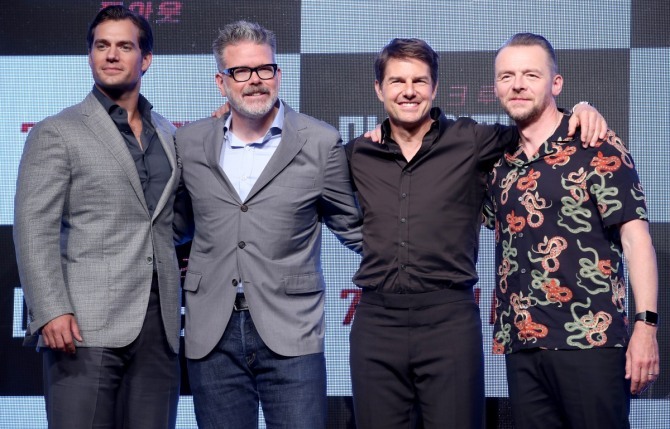 To entertain you,” Cruise said, during a press conference for the film in Seoul on Monday. While action is usually what people think of when talking about the series, the cast and director Christopher McQuarrie says it’s actually about the story. The sixth installment in the series follows Ethan Hunt, the top agent of a fictional espionage agency IMF, and his team that includes Benji, Luther Stickell and Ilsa Faust, played by Simon Pegg, Ving Rhames and Rebecca Ferguson. They encounter a special CIA division tasked with eliminating them. McQuarrie and the cast discussed the appeal of Ethan Hunt and the movie, saying that the story and the characters pull in the audience just as much as the action does, if not more. “All of that comes down to the character,” the director stressed. “Ethan doesn’t want to do the things that he’s doing. That’s where humor and the appeal of the character comes from. That shows the hero that he is. He’s not a daredevil. He does these things despite not wanting to. “What they (the heroes) achieve are superhuman feats and yet, the movie allows the audience to connect with them by showing how scared they are,” said Henry Cavill, who plays the role of CIA assassin August Walker, appearing in the series for the first time. Pegg, reprising his role as a brainy and trustworthy sidekick to Hunt, said that the film is ultimately about the team. “It differs from other spy franchises: It’s about a family, a group of people relying on each other. This one in particularly is about Ethan, our hero, about how he can’t let his team go,” he said. While the movie has been praised for its story, the live action is something to behold. Cruise actually injured himself while jumping from building to building, which is almost expected when you do most of your own stunts. “That was our easy day,” Cruise said with a laugh. Cruise said the team effort and the dedication from his team helped him push through in the process. “I always knew they had my back,” he said. So how long does Cruise plan on reprising the role of Ethan Hunt? “Forever. As long as I can go. We’ll just keep doing it. (In later films) I’ll be thrown out in a wheelchair,” Cruise said, showing his passion for playing the world’s most beloved superspy. “Mission: Impossible -- Fallout” opens in local theaters on July 25.